Duval Family, about 1903 in Oakland, California. Francis Cyprien, Francis Henry, Annie Marie Elvera & Alice Hyde Duval. On Monday I posted a photo of Grandfather Hyde and asked for opinions on my assessment of which Grandfather Hyde was in the photo. This spurred a whole lot of conversation between myself and Alex of Root to Tip. She dug up a few records for me and then my curiosity completely changed my research plans for the week in an exciting way. 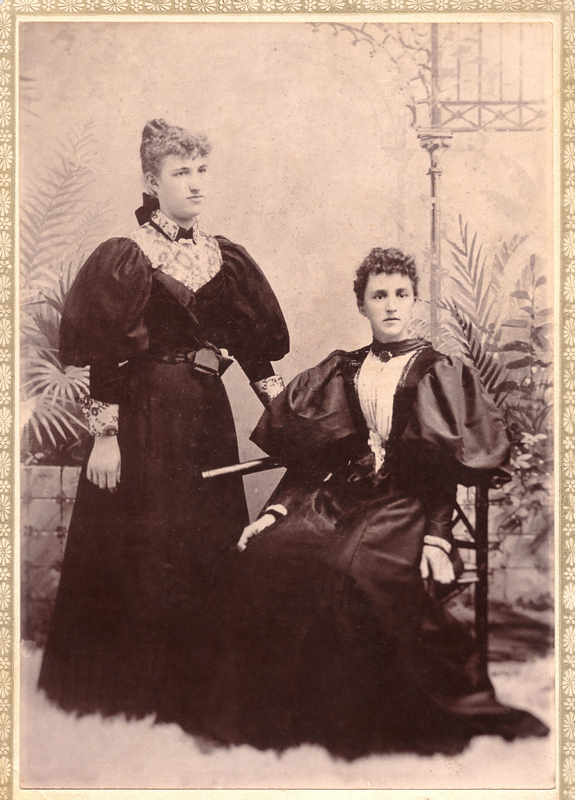 Since I have the Hyde family dominating my thoughts I decided to write about my most recent direct-line Hyde ancestor, Alice Hyde, my 2nd great grandmother. Alice was born 29 July 1880 in Muskoka, Ontario, Canada to William Henry Hyde and Ann Whiteley. Alice was born 7 years and 5 months after her parents were married but as far as I can tell, she is their first child. 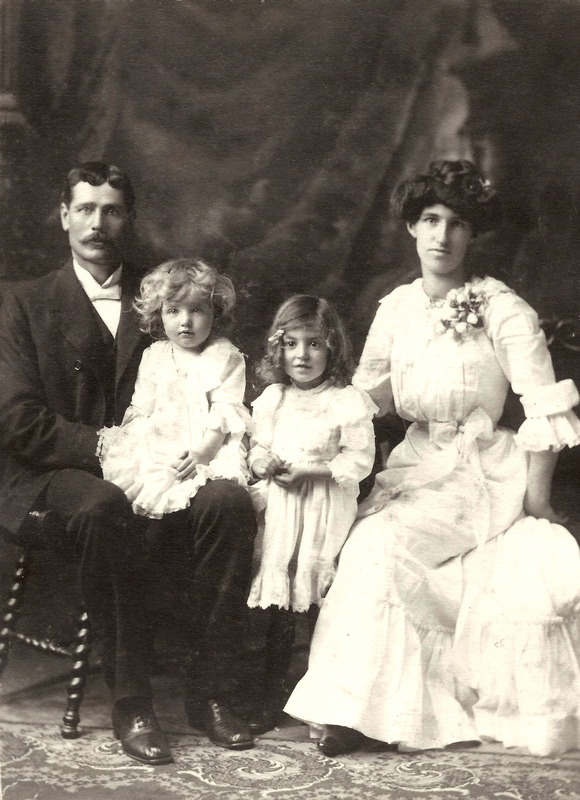 When Alice was just four years old, her mother Ann died as the result of childbirth while the family was living in Golden, British Columbia, Canada. Henry was away for work at the time of this tragedy. I imagine it was quite a shock to return home to his small, motherless family. Just shy of two months later, he marries Ann’s younger sister Alice in York, York, England and leaves his daughter Rosey to live with his parents in Sheffield, York, England. He kept Alice with him. Rosey may or may not be the child born just prior to Ann’s death. I wrote more about that here. Alice is now the step daughter of her aunt who is also named Alice. So now there are two Alice Hydes in the family and they are only about 11 years apart in age. I wonder what that was like for young Alice? Alice and her family eventually settled in Fairbanks, Alaska. Henry was known for having the first successful working farm in Fairbanks. During the year 1896 Henry became acquainted with a man by the name of Francis Cyprien Duval. Henry tried to convince Frank to claim a piece of land near his farm and try his hand at homesteading. Frank wasn’t interested. He had left Quebec to get away from farming. He was bound for Dawson. At the age of 16 Alice left her father’s home with Frank and together they traversed the famous Chilkoot Pass. They beat the Gold Rush by an entire year. Frank was able to do well mining in Dawson. He and Alice were married 12 November 1897 in Dawson, Alaska. One additional child was born and died prior to 1910, details currently unknown. Frank and Alice began their marriage in the wild Gold Rush town of Dawson, Alaska. After a short time they claimed land near Alice’s father’s farm on the Chena Slough 6 miles outside of Fairbanks. They spent the summers in Alaska and the winters in California. Frank built them a cabin in Alaska and they purchased a home in Oakland. My great grandfather, Francis Henry Duval, shared some lovely memories of the homestead in Alaska during an interview with my mom in the 70s. I recently re-listened to this recording and was excited to find answers to several of the questions I had. Among the many details, he talked about their garden. They kept a greenhouse in Alaska and had stoves in there to keep everything warm. They planted their vegetables in the greenhouse much earlier than anyone else. They would begin harvesting their lettuces, tomatoes and the like in the spring. They loaded their bounty into a canoe and took them into Fairbanks and sold them to restaurants. He shared many other interesting details that make it pretty clear that Frank and Alice were very industrious. After the big San Fransisco earthquake in 1906, a real estate man wrote to Frank and Alice to let them know that their house had been completely destroyed. He offered to sell the land for them. The Duvals decided to stay in Alaska and sell the land. Alice’s children were getting older. In order to attend school they had to walk along the railroad tracks for about 3 miles to arrive at the schoolhouse. Alice would send Vera and if the weather was good she would also send young Frank. She wanted her children to be able to attend school more easily and she wanted them to have a better education. In 1908 her father Henry died in Fairbanks. I’m sure this strengthened her resolve to leave. 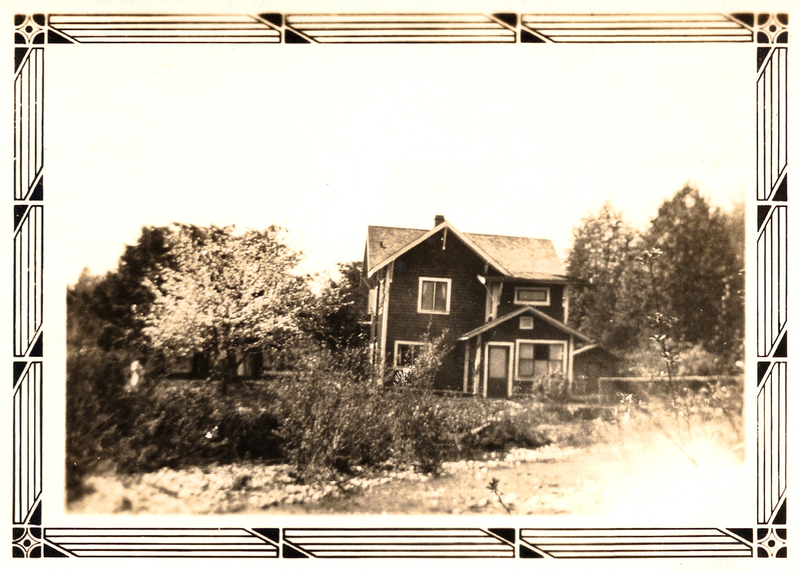 She was eventually able to persuade Frank to leave the homestead in Alaska and settle in Vancouver, British Columbia sometime between 1910 and 1911. They are in Fairbanks in the 1910 US Census and Vancouver in the 1911 Canadian Census. They only lived in Vancouver a short time before Frank tired of being in the city. He found a piece of land in Lynn Valley and built a two story home with a basement. The school was one block from their new home. My great grandfather recalls being in class one day when one of his schoolmates pointed out the window and exclaimed, “The Duval house is on fire!”. Everyone rushed out of class and ran toward the home. There was quite a gathering of townspeople on the lawn in front of the home. Young Delores had been left at home alone but was rescued when someone heard her cries from the basement. Shortly after young Frank arrived, Alice returned from her errand to find her home aflame. She started yelling for people to help save the furniture and whatever they could. Only young Frank was brave enough to help his mother and together they pulled as many items from the burning house as they could. Frank determined he would not rebuild his home himself and he hired someone to build on the same spot. Duval family home in Lynn Valley, British Columbia. In the spring of 1919, Frank was in a buggy accident while at work. He was a Forest Ranger and had rented a horse and buckboard to go out and take care of some of his work. His horse was spooked and he was thrown off the seat of the buckboard landing on his feet. His leg broke just above the ankle from the impact and the broken bone tore through the flesh landing in the dirt. The exposed flesh and bone were filthy. Frank was away from town, all alone. He took off his shirt, bound his leg and crawled along until he was able to find two sticks large enough to use as makeshift crutches. He slowly and painfully made his way toward town. It was a seven mile journey. The scared horses returned to their home without Frank and so men went out searching for him. He was rescued after he had traveled about a mile and a half and was taken to the hospital in Vancouver. From the time his leg was broken until he made it to the hospital 17 hours had passed. During that time he developed blood poisoning. He was in the hospital about 7-12 days. At first the doctors said he was doing well. Alice was bringing the children to the hospital to visit their father. Toward the end of his hospital stay he took a turn for the worse and the family was called back. The doctors told Alice that the only way to save his life was to amputate the leg at the knee. Frank refused. He worsened and lost consciousness, Alice consented to the amputation. The day after the amputation Frank died leaving Alice widowed with 5 children ranging in ages from 18 to 3 years old. Shortly after Frank’s death, Alice determined to leave Canada and returned to California. They went to Oakland to see the site of their former home to find it exactly as they had left it in the early spring of 1906. The family moved around a lot. Young Frank had the difficult responsibility of providing for his mother and siblings for many years. Young Frank married in 1930. For several months after he married, he continued to send money home to his mother. Eventually he passed the responsibility of her care to his younger brother. Her later years included additional struggles. She suffered from poor health and eventually lost another home. This time it seems she lost her home to the bank near the end of the depression. In December of 1940 she was arrested on the charge of Grand Larceny in Whatcom, Washington. She pled guilty and was imprisoned for a few weeks shy of 1 year. She died 8 1/2 years after her release, 24 June 1950 in Red Bluff, Tehama, California. There was not contact between Alice and her son Frank after her release. The circumstances of the last few years of her life are unknown to me. My grandmother does not have fond memories of Alice. She says she was a mean, nasty woman. I imagine Alice’s many losses were very difficult. I would like to think that she might have been kinder in her younger years. Maybe not gentle, I imagine she had to be pretty tough to survive in Alaska during that time period. But hopefully kind. She must have been brave and strong to endure all that she did. I hope her last few years of life brought some peace and stability. I hope she was able to enjoy her time in California before her death. Do you have any tough frontierswomen in your tree? What were they like? Next postTip: Get to know your local research facilities. You have a great story telling skill! I loved reading about her life. Thank you for sharing! Thank you for your nice compliment! I can’t take too much credit though. I listened to my great grandpa tell the stories on the CDs and then regurgitated them in my own words. It’s much easier to tell a story you have heard as a story than to tell a story you piece together from records. 🙂 I’ve been surprised at the number of unusual records I’ve been finding on this family. They are an interesting bunch. I have the arrest, booking, and plea records (multiple family members were involved) from the Washington State Archives. I need to do a little more digging to see if there are additional records from the prison. I found a few newspaper articles. Pretty interesting stuff! Excellent! Our ancestors were definitely interesting. What an amazing story; beautifully told. I hope Alice found some peace in her later years. Thanks for stopping by. I couldn’t view the photo you linked to. Is it a photo in Alaska?